Samsung has done superhero-themed phones but with the Galaxy Note8 it may branch out into space opera. 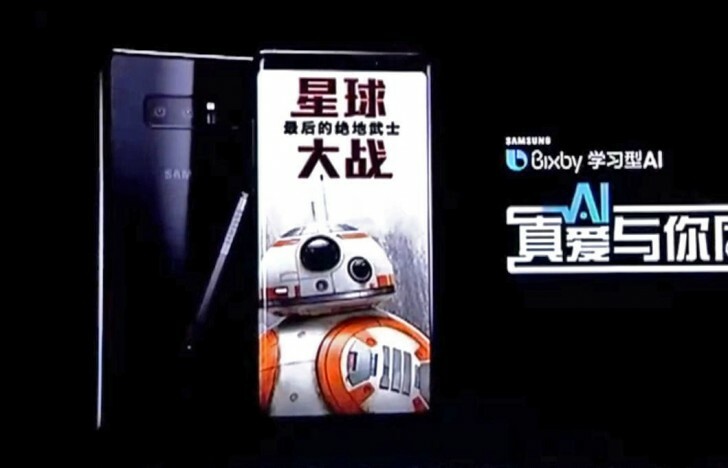 The BB-8 bot had a cameo in promo materials focused on upcoming upgrades to the Bixby AI assistant. Before you get too excited, the phone does not seem modified in any way. No Batman logo, no Avengers color schemes. At best it looks like a theme. Last week we heard about another Star Wars-themed phone – a OnePlus 5T. Seems like a popular choice, though we suppose both of these will wait for the premiere of The Last Jedi (December 15), if these devices exist at all. Still, Samsung does make a vacuum bot with storm trooper and even Darth Vader skins, so why not a Galaxy Note8? Is there a special Star Wars-themed OnePlus 5T on the way? so theyll put a logo from this lame movie and increase the price by a few hundred hoping for some rich parents to buy this lame sh** for their kids? That is interesting. I've watched TFA and Rogue One, and I really liked them, they appeal to me much more than the old movies. Guess it's a different target audience these days.